What Is APK File? What Is Simulator, Emulator And Real Device? APK : Android Application package. This is similar to .exe files which are used to install programs on windows. 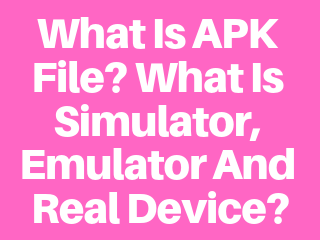 The only difference is that .apk files are designed to be used exclusively on Android device and you maybe required to download additional files before you run the application in the android. Why we are using them what is the use? See as of now we are going to test mobile applications means once after the application was developed , in android it will be apk file only. So to automate that application we need apk files, generally in really time we can get this apk files from the developer and for generic application we can download from playstore too. What is Real Testing Device? Testing on real device allows you to run your mobile applications and checks its functionality. Real device Testing assures you that your application will work smoothly in customer handsets. What is Emulator & Simulator? Emulators and Simulators are virtual devices. A virtual device is not the real phone but software which gives same functionality as the real phone (Except few functionality like the camera).